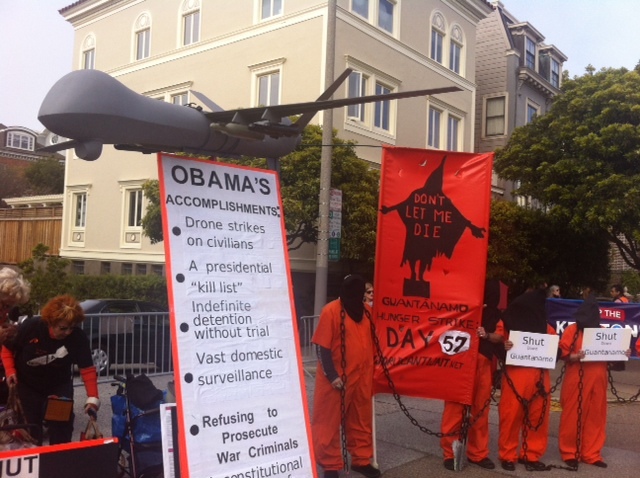 Hundreds of protesters touting various causes gathered this evening a block away from a mansion in San Francisco’s Pacific Heights neighborhood where President Barack Obama is set to attend a Democratic fundraiser later tonight. The crowd filled the intersection of Pacific and Baker streets, a block away from the home of philanthropists Ann and Gordon Getty, who are hosting Obama in a fundraising dinner for the Democratic Congressional Campaign Committee. 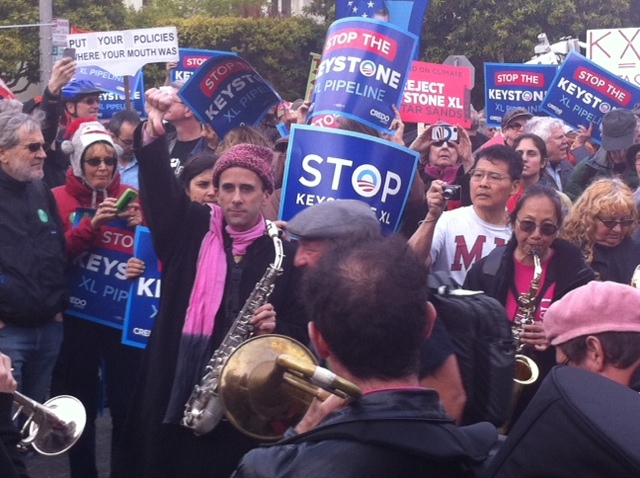 The largest group of protesters were shouting in opposition to Keystone XL, a proposed pipeline across the Midwest that would transport oil from tar sands in Canada. “The legacy of his presidency is at stake with this question of whether he’s going to approve or reject the Keystone XL pipeline,” said Becky Bond, political director of CREDO, one of the environmental groups organizing the protest. “This is something he doesn’t have to face every day in Washington, D.C., so this is our chance to deliver a message to him loud and clear,” Bond said. One anti-war group came carrying a large mock drone to show their opposition to the use of the unmanned aircraft in war zones. The group also brought people wearing fake orange prison jumpsuits in solidarity with Guantanamo Bay prisoners. The protesters then marched a few blocks away to Broadway and Divisadero Street, where some of tonight’s dinner attendees were arriving in their vehicles. Dozens of police officers lined the streets to ensure the vehicles had a clear path into the event. re-election campaign on a platform of raising taxes for the rich. Obama was scheduled to attend a cocktail reception at the home of billionaire hedge fund manager Tom Steyer and Kat Taylor before the dinner at the Gettys’ home. The president is scheduled to attend two more fundraisers along the Peninsula in Atherton on Thursday for the Democratic National Committee before departing from the Bay Area.